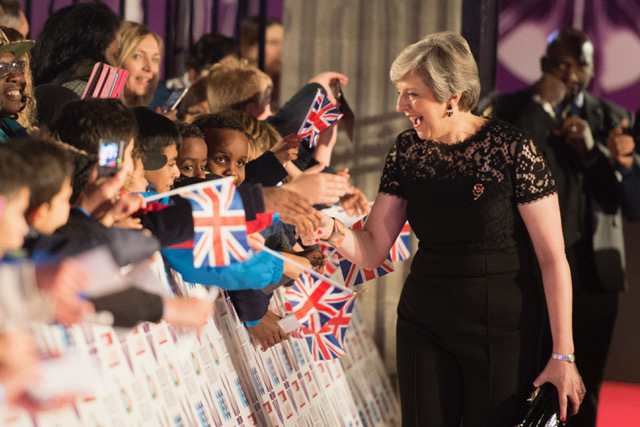 This week's State Dinner for the King and Queen of the Netherlands saw Theresa May pick a fabulous new evening gown for the occasion. Whilst I don't have this confirmed (as yet!) I'm pretty confident that her floor length navy dress with sequinned black arm detailing is an Amanda Wakeley number. Which pieces does the Prime Minister don for black tie occasions? 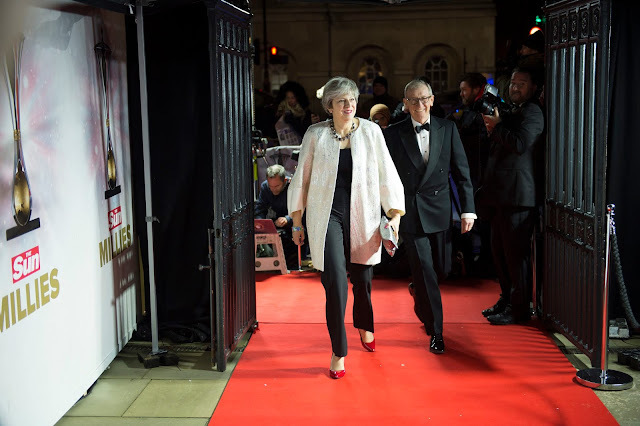 The red dress: last seen at Blenheim Palace for the visit of President Trump, this is one of May's more frequently worn evening gowns. We first saw it in 2016, teamed with a sky high pair of red patent heels from LK Bennett. We've also seen the PM wear it to the annual Mansion House dinner. It's daring and the perfect choice for spicing up the Westminster dinner circuit! Designer intel is still unknown - so if you have any tips then let us know! The bottle green gown: another chic choice, this deep green, floor length dress has a sheer overlay and is embroidered with delicate black flowers. 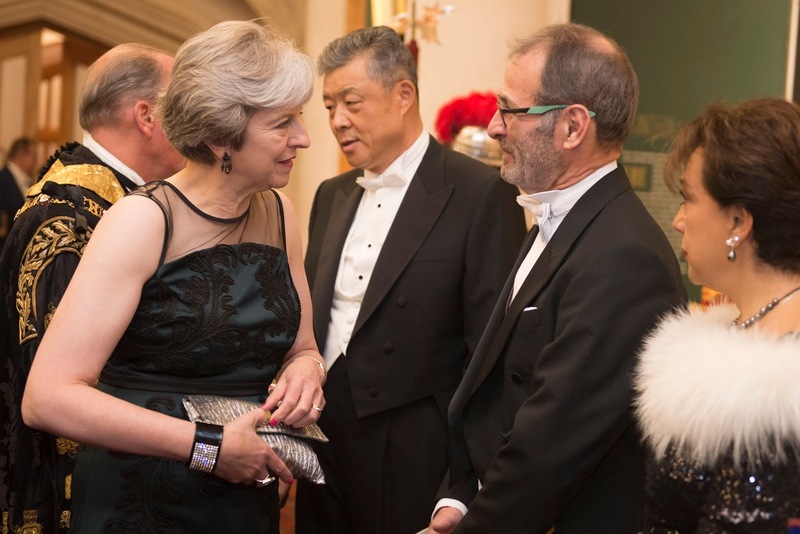 The gown has made a few appearances in 2018, notably at the Commonwealth Heads of Government dinner at Buckingham Palace and at a trip to Salzburg in the summer. May also wore it to Mansion House, teaming it with the chic gold Twister block heels from Russell & Bromley. The cream Amanda Wakeley coat: mixing it up, May has a great cream and silver embellished coat from Amanda Wakeley that she often wears to evening events. Teamed with trousers, this is relaxed and quirky cool look. 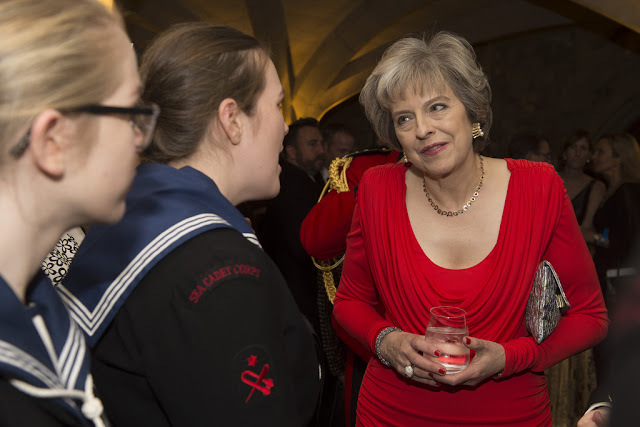 The black lace jumpsuit: perhaps my favourite outfit in the mix, the PM's daring black lace jumpsuit is one that turned heads on its first outing. 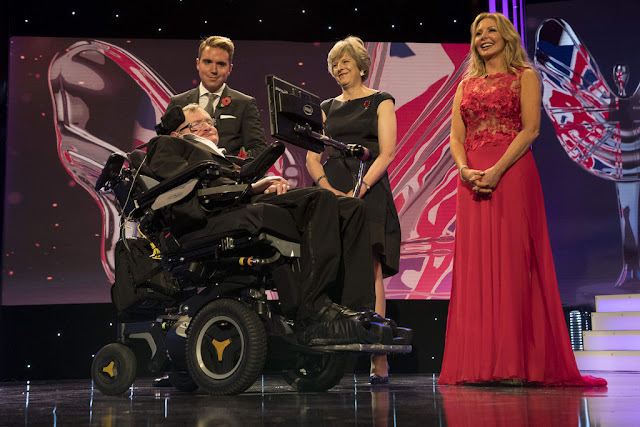 We've seen her pair it with those chic red patent heels- as well as a pair of glitzy jewelled black heels for a night at the Pride of Britain Awards. 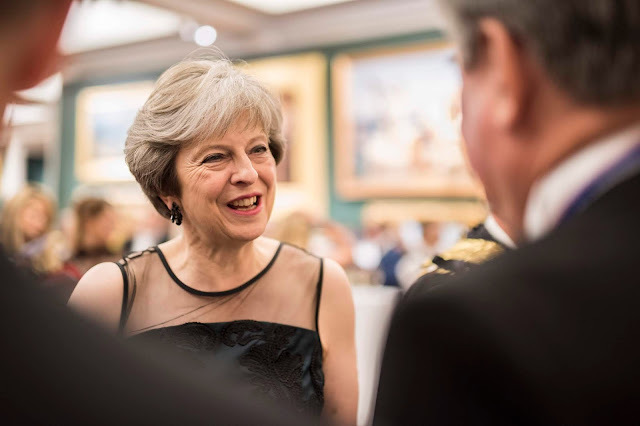 The midnight Amanda Wakeley dress: and who remembers the sleeveless, midnight mini dress from Amanda Wakeley from 2016? Bring this back Theresa! And on the accessories front? A sprinkling of Anya Hindmarch: we often see May take her vintage silver braided Valorie evening clutch. 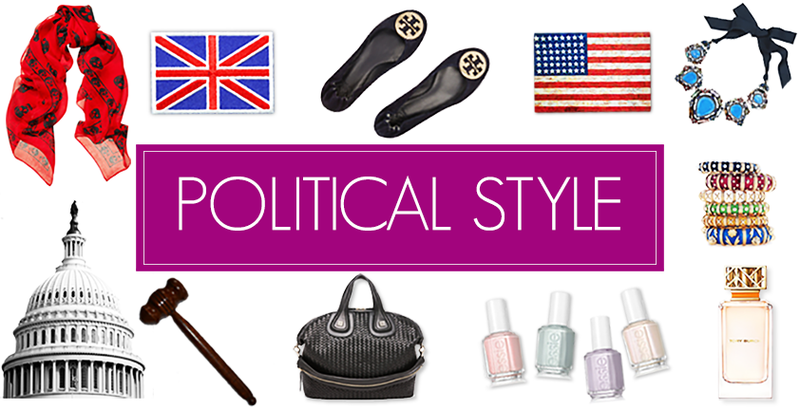 It's the perfect size for all those essentials, and works well with each of the choices above. A great investment piece! Swarovski jewellery: who doesn't love a bit of bling? 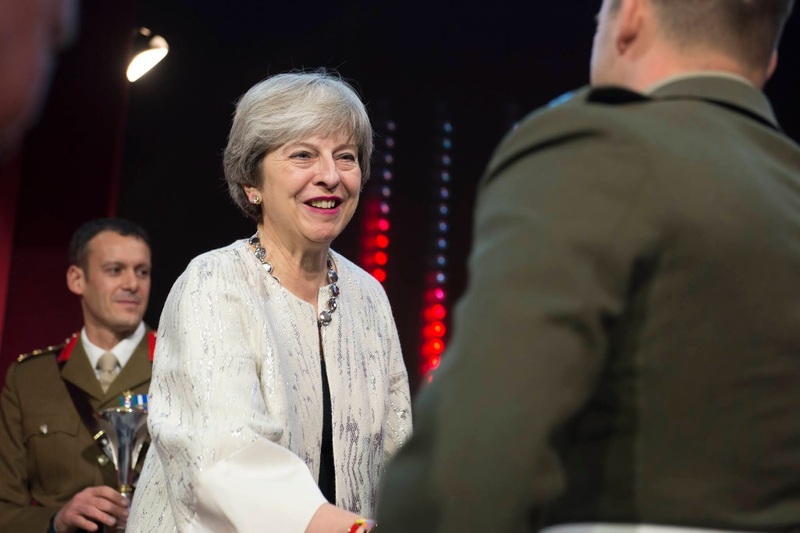 May dons some seriously chic Swarovski costume jewellery for her evening events. 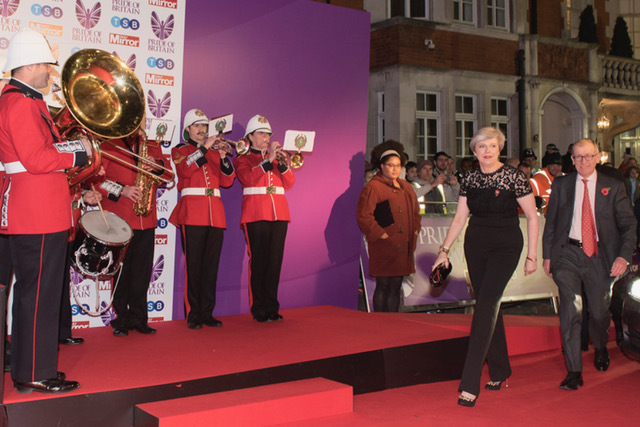 I particularly love an oversized cuff and earrings that the PM has worn on a few occasions. Hermes scarf: and for those chilly nights, an oversized Hermes scarf is a great accessory to have! The bolder the better. What's your favourite Prime Ministerial black tie look?